BREAKING NEWS: AEC declares GetUp independent! After 3 investigations, review by 3 independent agencies and over 13 years of pressure and attack – we did it! This is a landmark decision for independent campaigning in Australia, and it's thanks to tens of thousands of GetUp members like you. So what did the AEC say? GetUp campaigns on issues, not party politics. In particular, the how-to-vote cards handed out by thousands of GetUp volunteers at the election ranked candidates according to their policies on our issues. An organisation can campaign for progressive causes without acting for the benefit of all parties on that side of the political spectrum. There is no evidence that GetUp is controlled by a registered political party or parties. There were no financial donations made to, or received from, any political parties. 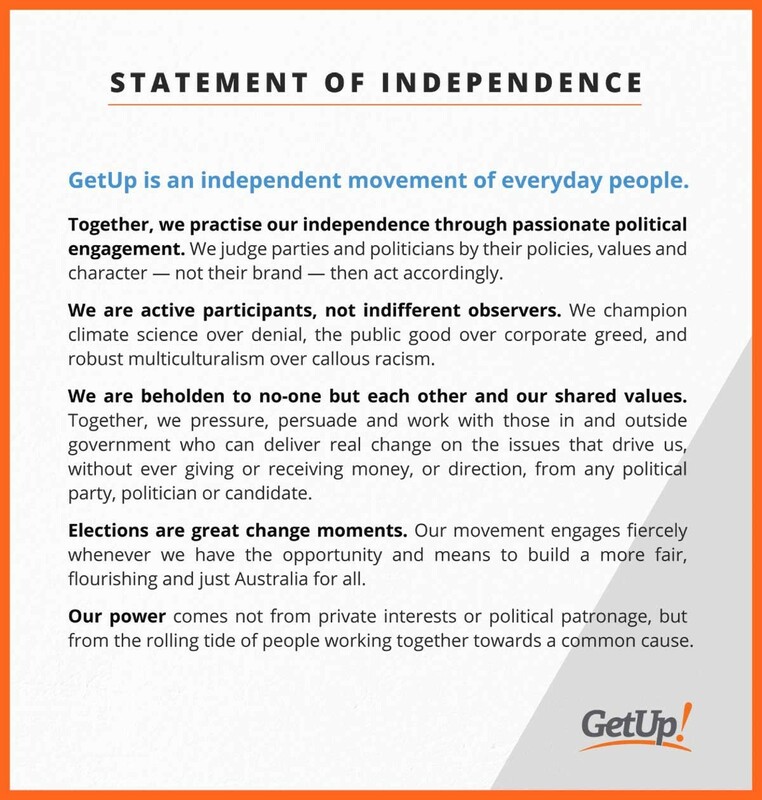 Multiple independent agencies, including the Commonwealth Department of Public Prosecutions and Australian Government Solicitor, were consultated on GetUp's independence. Click here to see the AEC's full decision. CAN YOU CHIP IN WITH A WEEKLY DONATION? Can you join the GetUp Crew with a regular, weekly donation to support our work heading into a nation-changing election? Regular funding provided by the GetUp Crew means we have the resources to plan for the long term fight. And it means we're ready and able to respond to new, sudden attacks on GetUp members or our friends and allies.